New York City, March 12, 2014, — When most people think of modern China, it’s not usually through the lens of its fine arts or innovative design; when most people think of Chinese art, it doesn’t tend to be through the lens of modernity. Those who are more politically aware might knew of Ai Weiwei, the artist and activist who achieved international fame through exhibits such as Sunflower Seeds and his work on the architecture of the Bird’s Nest Stadium for the 2008 Beijing Olympics, or his 2011 arrest. Those culturally minded may know of Liu Bolin, dubbed ‘The Invisible Man,’ who recently gave a talk at the TED Conference. 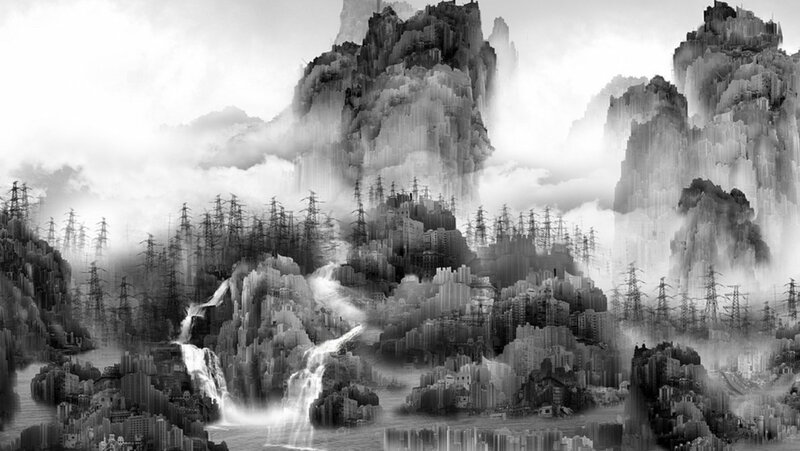 This composite photograph named View of Tide was created by Yang Yongliang (born 1980) through Yang’s distinctive method of “painting” with digital photography. The seemingly harmonious traditional landscape, composed of countless high-rise apartments, power-line towers and construction cranes, becomes a subtle yet critical response to urbanization. To strip a culture away from its modernity (and art indeed is an important aspect of Chinese culture) creates a dangerous situation where the institution itself becomes no longer a living, breathing thing, a multifaceted understanding of self in relation to history and society that responds to change and circumstance, but rather a lifeless relic to be put on display, conserved, and studied. It posits culture as something that is immobile, unadaptable, and most importantly, no longer relevant for anything other than a consumable performance for paying voyeurs into an ‘exotic’ Other. Though fields like fashion design (through courtiers and labels such as Guo Pei, NE Tiger, and Shanghai Tang) have been rapidly growing throughout the last decade and a half, Chinese artistry is still largely associated with the past. Considered the realm of bearded men with flowing robes and long hair, modern artists are largely disregarded outside of China, despite their increasing relevance, and though the art they make is certainly more pertinent politically, socially, and culturally to our modern day than Song Dynasty landscapes, yet the focus on them in the narrative and understanding of Chinese art and modern China both can be considered diluted at most. According to the Metropolitan Museum of Art’s website, Ink Art: Past as Present in Contemporary China is “the first major exhibition of Chinese contemporary art ever mounted by the [museum],” which marks it as a divergence to the trend. Most of the Metropolitan’s permanent collection currently on display in their Chinese wing consists of sculptures, bronze, clay, and textile, ranging from as early as the Zhou Dynasty to as late as the Qing. The exhibit currently on display, however, features only works that were made after 1980 – only after Deng Xiaoping’s reform of the Chinese economy. These artists who have grown up during times like the Cultural Revolution and the capitalisation of the Chinese economy, the art they make, particularly the art made after the 1980s, can be considered to be reactions, commentary, and outgrowths on the rapidly changing landscape of modern China. This exhibit is revolutionary in ways more than the political statements its artists (among whom Ai Weiwei figure) make. The art featured in the exhibit are largely ink-and-wash painting (hence its title Ink Art), and are treated as a descendent of the Song Dynasty form, and forms part of the continuum of traditional Chinese art, applicable to modernity, and it is in this that the exhibit is truly ground-breaking. Chinese art cannot be split neatly into “ancient” and “contemporary,” even as more and more non-indigenous styles and techniques are incorporated into art education and art itself, and this exhibit showcases how art changes alongside the flow of history and the re-imagining of culture and an artist’s perception of their own relationship to the world. Yang Yongliang’s digitally manipulated panoramas and Duan Jianyu’s delicate ink-on-cardboard paintings are placed in context with those carvings of Buddhist figures and long scrolls of calligraphy that constitute the most well-known parts of the Met’s Chinese collection. Modern China, and modern Chinese culture, and modern Chinese art are not separated from what is considered classically, traditionally, historically ‘Chinese’ by the gulf of the socialist years; rather, it’s more useful to consider the effect and the change the events like the Cultural Revolution or the Tiananmen Square movement have had on Chinese culture. It hasn’t disappeared, it’s merely changed, and the presentation of art in this way serves to emphasize that Chinese society is still vibrant, still alive, and is increasingly relevant to today’s world. The exhibit will be on display at the Metropolitan Museum of Art in New York City until April 6, 2014. To preview the art works, please visit the MET’s website.